We’d love your help. Let us know what’s wrong with this preview of Eating Your Way Through Luke's Gospel by Robert J. Karris. Robert Karris spreads before us a unique and delightful framing of the food theme in the Gospel of Luke. Karris describes the food and drink popular in Jesus' day. He also documents the social, political, and general contexts in which the food was prepared and eaten. He outlines the social roles Jesus assumes in Luke's Gospel in relation to food and meals, as well as the re Robert Karris spreads before us a unique and delightful framing of the food theme in the Gospel of Luke. Karris describes the food and drink popular in Jesus' day. He also documents the social, political, and general contexts in which the food was prepared and eaten. He outlines the social roles Jesus assumes in Luke's Gospel in relation to food and meals, as well as the relationship between women and food. Karris also examines the eucharistic implications of the way food and drink are portrayed. This volume invites readers to get actively involved in the process of discovery by checking Scripture references alongside the author. Food themes in the other three Gospels are also briefly compared with Luke's Gospel. Questions to stimulate an appetite for discussion or reflection and suggestions for further reading are provided at the end of each chapter. 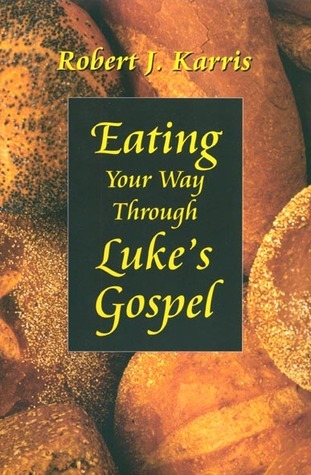 To ask other readers questions about Eating Your Way Through Luke's Gospel, please sign up. Though a little more word study than I had hoped, there was a lot of great information--I could see how this would really inform a dinner study of the Gospel and would be a great way to frame a Bible study of the entire Gospel. A few choice morsels, but mostly bone and gristle.